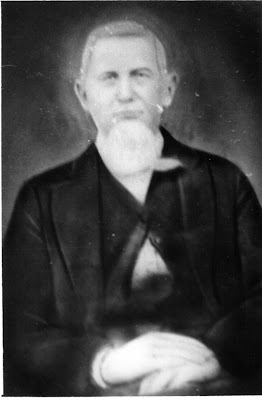 George Washington Sanchez (1819-1903) was Francis Roman Sanchez' fourth son [child]. He was the one who completed the probate on Francis Roman Sanchez' estate. Both sons, Alexander Boneparte and Francis Palmer Sanchez lived to far south of Newnansville to conveniently represent the estate. John Joseph Sanchez, #3 son, initiated the probate but died before completion. I got a copy of this photograph from one of his descendants. There is a family Bible that George Washington Sanchez started, however it is reported to be in bad shape. If you look at his descendant's chart, he had three wives and numerous children. You should note too that the Civil War claimed several of them. He served in the Indian Wars and got a land bounty, but that is good for a later post. I am the great grandson of G.W. and would like to email and exchange information on the family.